Per Shea Moisture: This lightweight, daily conditioner restores moisture and smoothes dry hair cuticles. No more knots, snarls, and tangles. Tames frizz as it define and enhances natural curl. 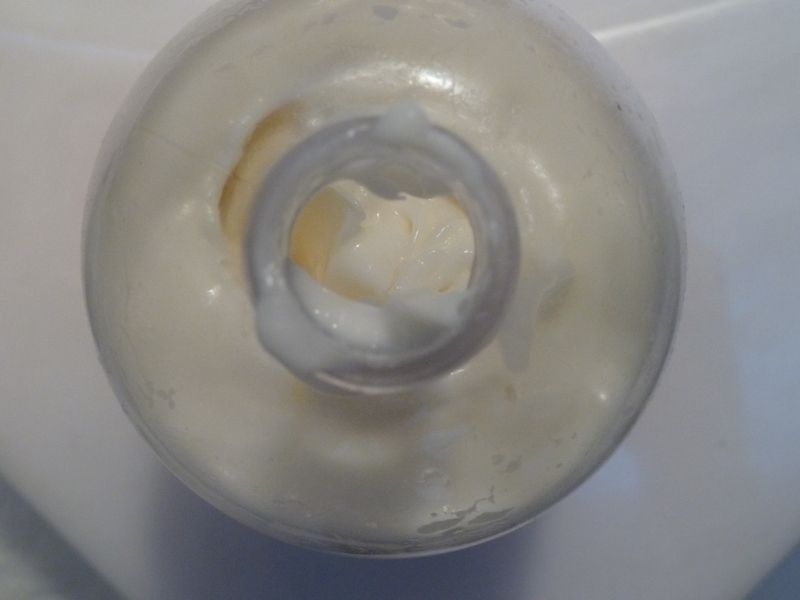 Key Ingredients: Coconut Oil: Hydrates and protects hair while reducing breakage. Silk Protein: Smoothes hair for a soft, silky feel. Neem Oil: Controls frizz while adding brilliant shine. Other Ingredients: Deionized Water, Cocos Nucifera(Coconut)Oil, Butyrospermum Parkii (Shea Butter) Sorbitol Esters, Mangifera Indica (Mango), Seed Butter, Simmondsia chinensis seed (Jojoba) Oil, Glycine Soja (Soybean) Oil, Olea Europaea (Olive) Fruit Oilm Cetyl Alcohol, Behentrimonium Chloride, Panthenol (Pro-Vitamin B-5) Proprietary Essential Oil Blend, Aloe Barbadenis Leaf Extract, Hibiscus Sabdariffa Extract, Tocopherol (Vitamin E), Melia Azadirachta (Nee) Seed Oil, Rosemary Extract, Caprylyl glycol. Directions: After shampooing, apply generously and comb through for even distribution. Leave in for 3 minutes. Rinse. Style as desired. Scent: Now I don’t think I have ever smelled anything that was hibiscus scented however, I don’t really think this product smells like coconut so I gonna say it smells like hibiscus, either way the scent is pleasant and not too overwhelming. Availability: This product is only available at select Targets (click here for store listings). I purchased this product from the Target in Colombia Heights in Washington DC. I made a special trip to this Target because according to the list no Target in Massachusetts is carrying the new SheaMoisture products. This weekend I am at the Target in South Bay (Dorchester, MA) this past weekend to scoop up items from the Parabal Gurung for Target collection and what do I spy in the hair care section…this product and the coconut and hibiscus co-wash conditioning cleanser. So if you are in Massachusetts and want to try these products now you know of at least one Target which carries them. Price: Unfortunately, I bought this a while back and can’t remember the exact price $9.99 or $11.99. 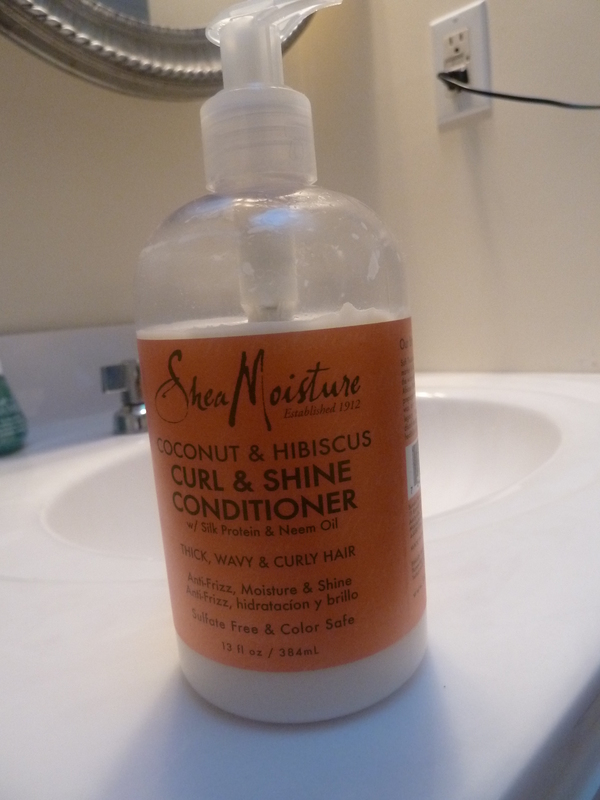 Final Thoughts: I hadn’t used any products from the SheaMoisture Coconut & Hibiscus line so I was excited to try this product. Overall, I think it’s a really good product, again the smell is pleasant, the consistency is thick which I like since hair is pretty dense. My hair felt moisturized after I’d rinsed the product out. Would I buy the product again? I doubt it. Again this is a really good conditioner however, it a rinse out conditioner, it is not a deep conditioner nor is it a leave- in. Now, I am a hard-core product junkie and am always up for buying products however, I can’t justify spending $9.99 -$11.99 on a conditioner that I apply to my hair for 3 minutes and then rinse out. If I was able to use this product as leave in spite of what the label/directions say I would buy it again. However, the product has silk protein in it and I am afraid it may eventually result in dry, brittle hair. 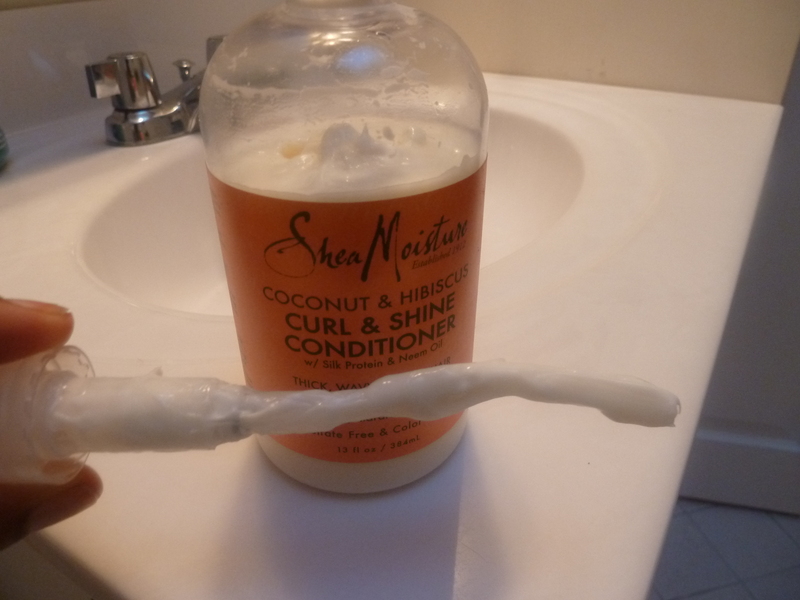 Will you be trying SheaMoisture’s Coconut & Hibiscus Curl & Shine Conditioner? I know I’m way too late, but you can definitely use it as all three. A leave-in is just a diluted thinner version of a conditioner and a conditioner is just a thinner deep conditioner. What’s important is the ingredients. With shea moisture, each line (color) is made with the same base ingredients, and since its all natural and without harsh chemicals all that changes is the consistency. If you want added moisture, softness, etc, just stir in some honey or additions oils and use as deep conditioner. I never thought to add in honey! I am going to try that! Thanks! !